In Allison Amend’s latest novel, Enchanted Islands, she explores the lives spies on a mission for the Office of Naval Intelligence living on the Galapagos Islands. 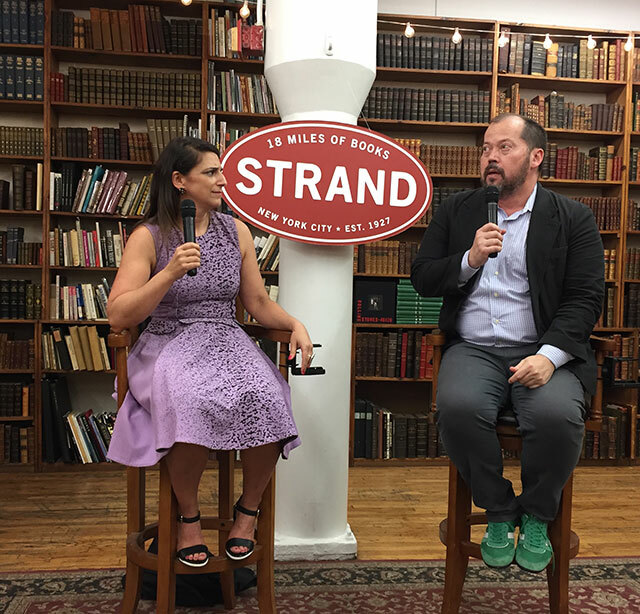 She was joined at The Strand by Alexander Chee, author of The Queen of the Night. The memoirs of Frances Conway, a survivalist who lived on the islands, served as the inspiration for the novel. “I just sort of fell in love with her voice,” Amend says. Beyond that, the novel is an invention. Alexander Chee notes that both their novels feature spies. In Chee’s novel, his protagonist, Lilliet Berne, is an unwitting spy. He explains writing about her as a spy came naturally. She was a diva who’s voice directed his writing. “All the best spying was done on Germans,” Amend says, although she also adds “I don’t particularly like spy novels.” She was much more interested in the characters than she was in the details of the spying. Amend says she read several spy novels by John le Carré in her attempt to prepare and look at the construction of a spy novel. Every time she was shocked. She also looked at non-fiction books about spy networks and says she was mostly interest in the trade craft of spying. She went down the rabbit hole of researching technology, she explains, saying she obsessed over microdots. Microdots were small images containing information that were extremely tiny and very popular in the midcentury. “I always do too much research,” she adds, because for her research counts as writing without actually writing. A retired naval captain read through the manuscript as well in order to ensure that the references to naval elements were accurate. Amend says she learns that ships and boats are different things: a boat can fit on a ship. In addition to researching spy methods, Amend also had access to memoirs. She really liked the voice of the real Francis. The woman also lived during a seminal period in history. The novel came about because Amend had been reading the memoirs and wondering why Francis and her husband were on the islands. She suspects Francis’s husband had a drinking problem and the isolation may have been a motivation. The friendship in the novel is also an essential element. Amend wanted to explore non-traditional relationships and show how friendship alone can fulfill the role of marriage. Her novel is an exploration of the ideas of friendship. Amend at first thought the book would all take place on Galapagos, but only about a third of the novel actually unfolds there. Francis lived on the islands for seven years, but Amend could only stay there for five days. “I hate camping, but now I really hate camping,” she says.